The Ancient Roman Empire was a vast empire with people from different ethnicities speaking different languages. This meant many languages were spoken through different places of the Empire. However, two major languages of the empire were Latin and Greek. Latin in particular was the official language of the empire because it was the original language of Rome. Latin was necessary for anyone seeking to play an important role in administration, politics, and military. It was also the language of law and literature, although there was considerable difference between the Latin used in literature and the one used in everyday life. The history of Roman language Latin goes back to the early years of Rome. Latin was the original language of Rome and remained the dominant language for many centuries. This language relied little on the word order and conveyed meaning mainly through a system of affixes attached with word stems. The language itself was also inspired by the Greek language. Throughout the history of the Roman Republic and Empire, Latin remained the dominant language although Greek was also a respectable language among the elite because most of the literature that they read was either in Greek or translated from it. 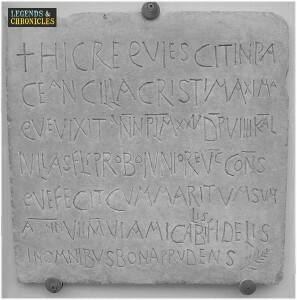 A gravestone from ancient Rome. 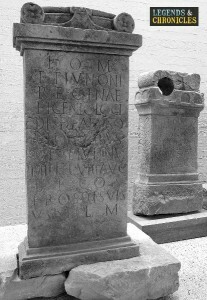 While Latin remained the most important ancient Roman language in the region of present day Italy, many other languages were spoken in other regions of the empire. For instance, Koine Greek was widely spoken and understood in the region of eastern Mediterranean and Asia Minor. The Roman elite were fluent in Greek because it helped them in communication beyond the empire. Other ancient Roman languages that were spoken in different regions of the empire included Punic, Coptic, Aramaic, and Syriac. Rome was a vast empire and modern means of communication were not available. Thus different dialects of ancient Roman language, Latin, were spoken in different parts of the empire. The first distinction to be made is between the literary Latin and the ‘vulgar’ Latin. The former was used in literature and high culture while the latter was the Latin used by the masses. Further, as the Empire expanded, Latin also absorbed words from other languages to give rise to new variations. An important dialect of ancient Roman language was in Gaul where it incorporated words from several other languages and was known as Romanic language. The written ancient Roman language was significantly different from the language spoken in ordinary life and was much more refined. The intellectual elite of Rome also commonly received education in Greek and were thus bilingual, fluent in both Latin and Greek. This was because a lot of great works of Greek philosophers were being translated into Latin and this increased the influence of Greek on the Roman intellectuals. Greek even attained the status of a semi-official language in the reign of Emperor Claudius. The Roman Empire was a vast collection of different countries and people with different ethnicities. Thus the languages spoken in ancient Roman Empire can be distributed with respect to geography. In the Italian peninsula, Latin and Greek were the most common languages. In the Western provinces of the Empire, Celtic languages were spoken but were eventually taken over by Latin. Similarly, in the African provinces, Punic and various Afroasiatic languages were spoken while Latin was common in the urban centres. Coptic language dominated in Egypt while in the Eastern provinces Greek was most commonly spoken language. An example of the Roman alphabet being used in a scripture. A special number system was used in ancient Roman language which was based on the so-called Roman numerals. This is the number system in which 1 is represented by I, 2 by II, 3 by III, and so on. The Roman numerals continued to be used throughout the Roman Empire and even after that till, by around the 14th century, they were replaced by more convenient and efficient Indo-Arabic numerals. However, the use of Roman numerals for minor applications exists till this day. The alphabet used in the ancient Roman language is known as the Roman alphabet. It was influenced by the earlier Greek alphabet and the Romans developed it further. With the passage of time, a script with upper and lower case letters was developed. Letters of modern English have been heavily inspired by the Roman letters. Some of the major languages where letters are influenced directly by ancient Roman language include English, German, and Spanish. Ancient Roman language is said to have given rise to the idea of calligraphy in the Western world. Roman calligraphy can be found on stones, walls, and manuscripts throughout the Empire as well as through the medieval ages in Europe. After the fall of the Roman Empire, its cultural and literal impact remained and this included calligraphy as well. The culture of calligraphy that was developed during the time of the Roman Empire was taken over by medieval Christianity and developed further into various styles. This was particularly done in the copying of the sacred texts, particularly the Bible. In ancient Rome, the primary language was Latin, however, the Latin that was used in literature and high culture was significantly different from the Latin used by the masses, the later called ‘vulgar Latin’. With the conquest of Greece by Rome, the influence of Greek language and culture increased in Rome and it became customary for the Roman elite to be well versed in Greek. Further, in other provinces of the Empire, many different languages were spoken some of which became extinct because of the increasing influence of Latin.